The annual survey of international trade in banking services (ITBS) covers the functioning of overseas branches/ subsidiaries of Indian banks and branches of foreign banks operating in India. The survey collects the profile of their fund/non-fund based business as well as their income, expenditure and profitability. During 2016-17, bank credit, interest income and profitability declined for all categories of banks with cross-border presence and their consolidated balance sheet also contracted, reflecting global moderation of trade in banking services1. International trade in banking services (ITBS) covers banking services provided to residents of an economy through local presence of (a) foreign banks and (b) foreign affiliates. It includes fund-based services (such as, deposit-taking, lending to firms, consumer finance) and a host of non-asset-based services (e.g., securities underwriting, local currency bond trading, foreign exchange trading, custody services, financial consultancy services, funds transfer and management services).2 Over the decades, the number of Indian banking outlets operating abroad and the number of branches of foreign banks operating in India have increased to meet the demand for cross-border banking services and it is useful to assess their efficiency and other parameters regularly. The framework of the General Agreement on Trade in Services (GATS) under the World Trade Organisation (WTO) envisages that delivery of any commercial service can be in one of the four modes, viz., Mode-1 (cross-border exchange), Mode-2 (consumption abroad), Mode-3 (commercial presence) and Mode 4 (movement of natural persons), as per the global manual of statistics of international trade in services (MSITS). Service rendered by a bank with cross-border presence in the territory of the country availing service, comes under Mode-3. Such presence can be through various investment vehicles like representative offices, branches, subsidiaries, associates and correspondents. GATS emphasises inter alia the need of consistent and comparable statistics on ITBS for assessing the progress of liberalisation of financial services sector. The Reserve Bank has been conducting the annual ITBS survey since 2006-07 to compile information on banking services provided under the Mode-3 of supply. The survey covers overseas branches and subsidiaries of Indian banks as well as foreign banks operating in India. As per the IMF’s Balance of Payments and International Investment Position Manual: Sixth edition (BPM6), subsidiary is a direct investment enterprise (DIE) over which direct investor is able to exercise control, which is assumed to exist if the investor has majority share in total equity of the investment recipient enterprise. The 2016-17 survey round covered 192 overseas branches and 325 overseas subsidiaries of Indian banks as well as 286 branches of foreign banks operating in India. As all banks with cross-border presence responded to the survey, the results present census position, though the data for the latest year remain provisional. In this article, the salient features of the international trade in banking services in the last few years are analysed in terms of branch network (section 2), fund based and non-fund based business (section 3 and 4) and profitability (section 5). Some concluding thoughts are given in section 6. Cross-border presence of banks has increased over the years in line with the growing demand from cross-border trade and other activities. The number of Indian banks’ overseas branches increased gradually from 121(with 2,629 employees) in March 2008 to 192 (with 3,984 employees) in March 2017 (Chart 1). The highest number of such branches was in the United Kingdom (33), followed by Hong Kong (17), Singapore (16), United Arab Emirates (15), Sri Lanka (13) and South Africa (12). Public sector banks dominated the overseas presence of Indian banks, where State Bank of India had the largest overseas presence (61 branches in 22 countries) followed by Bank of Baroda (47 branches in 15 countries). The number of foreign bank branches increased from 273 in March 2008 to 317 in March 2016 before declining to 286 in March 2017 and their staff-strength declined from 30,159 in March 2008 to 24,766 in March 2017. Indian banks’ overseas branches employed 63.3 per cent local employees whereas 99.3 per cent of foreign banks employees working in India were local (Table 1). Bucking the past trend, the total assets/liabilities of all groups of banks (viz., overseas branches of Indian banks, their subsidiaries operating abroad and foreign banks’ branches operating in India) contracted in 2016-17 (Table 2 and Chart 2). Business of Indian banks’ branches abroad and Indian banks’ subsidiaries abroad recorded higher contraction (-5.2 per cent and -5.7 per cent, respectively) as compared to foreign banks operating in India (-1.4 per cent). * Using end-March RBI reference rate of Rupee/US Dollar. It is noteworthy that on average, the balance sheet of all bank-groups has grown at a lower pace during the latest three years (2014-17) than in the past (2009-14). Similar pattern is witnessed at the global level in the international banking statistics (IBS) of the Bank for International Settlements (Chart 3). It is noted that the combined cross-border liabilities and assets (locational banking statistics – LBS) of all IBS-reporting countries in March 2017 were over 5 per cent lower than their level in March 2014. This can be attributed to lower requirements of bank-financing in light of moderate levels of economic activities, which has been a widespread concern and therefore necessitated measures like sustained low interest rate regime, easy liquidity conditions and several other policy measures, at the global level. India’s share in IBS liabilities/assets is relatively low but it has gradually increased over 2002-2016. At end-March 2016, India’s share in the combined liabilities and assets of IBS-reporting countries stood at 0.65 per cent and 0.24 per cent, respectively. These, however, declined marginally during 2016-17 (Chart 4). The tempered condition of fund-based banking business (Table 2 and Chart 2) is best reflected in the decline in loans extended by the three bank-groups (Chart 5). It is important to note here that lending accounted for nearly 60 per cent of the US$ 224 billion asset-base of overseas branches of Indian banks in March 2017 whereas it constituted 42 per cent of foreign bank’s assets in India (US$ 125 billion). On the liabilities side, all bank groups barring foreign banks’ branches in India witnessed decline in deposits during 2016-17. Foreign banks in India, like other banks in India, witnessed a surge in their deposit base following the demonetisation of specified bank notes (SBNs) during the later part of the year. Deposit mobilisation, however, has not been a constraint for lending by these banks with cross-border presence as they mobilise resources through other avenues, including headquarter funding. 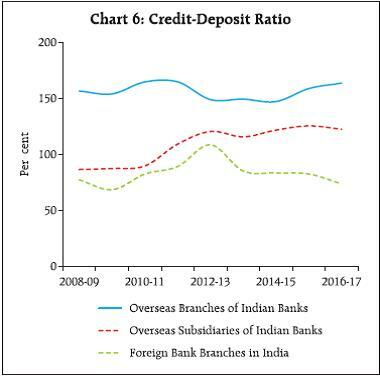 As a result, their credit-deposit ratio has been generally around 100 per cent or even well above that, which is also the case of overseas branches of Indian banks consistently (Chart 6). Banks charge explicit and implicit fees or commission to customers for rendering various banking services. Information on such fee and commission provides a valuable sketch of international trade in banking services. The ITBS survey classifies such services into eleven major groups, as per the MSITS. The share of fee income in total income of various groups of banks ranged between 11-22 per cent (Table 3). Fee income of Indian banks’ overseas subsidiaries declined for the third consecutive year in 2016-17 but it increased for Indian banks’ branches operating abroad and foreign banks’ branches operating in India, after a dip in the previous year (Table 3). It was evenly distributed across the four quarters of 2016-17 (Chart 7). Indian banks’ overseas branches maintained their focus on rendering ‘credit related services’, ‘trade finance related services’ and ‘derivative, stock, securities, foreign exchange trading services’, which together accounted for over 70 per cent of their fee income during 2016-17. Foreign banks operating in India had more diversified platter and ‘payment and money transmission services’ was the highest source of fee income (Table 4). Earnings of Indian banks’ branches in the UK from rendering banking services were the highest followed by those in the UAE, Hong Kong and Singapore (Table 5) and a dominant portion of their fee income is earned from services rendered to residents (Chart 8). Earnings of banks from the USA and Japan in India from such operations remained higher than the amount accrued from similar operations by Indian banks in these countries. 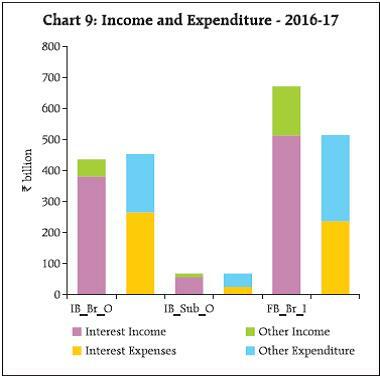 The waning of advances during 2016-17 led to 2.9 per cent drop in interest income of overseas branches of Indian banks (IB_Br_O) and their total income declined by 4.6 per cent as non-interest income also dropped significantly. This led to the a typical situation of their expenditure exceeding income during the year. Foreign banks in India (FB_Br_I) also had lower interest income though higher non-interest earnings led to 3.8 per cent growth in their total income. The divergence in business funding models of banks was appropriately reflected in the share of interest expenses in total expenditure which was 58.6 per cent for overseas branches of Indian banks, 37.5 per cent for overseas subsidiaries of Indian banks (IB_Sub_O) and 46.1 per cent for foreign banks operating in India (Chart 9 and Table 6). Despite lower asset base, foreign banks in India generally recorded higher profitability than the overseas branches and subsidiaries of Indian banks. Focus on non-fund based activities generating higher fee income contributed to this. 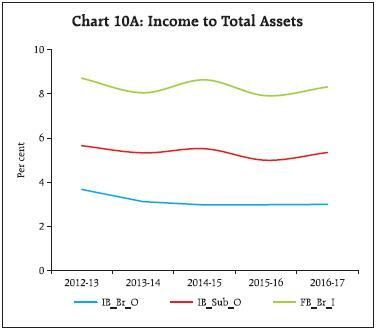 The decline in credit base and interest income across all groups of banks during 2016-17 coincided with lowering of asset base and increase in non-interest income for foreign banks in India and, as such, the income to total assets ratio did not undergo any major shift. 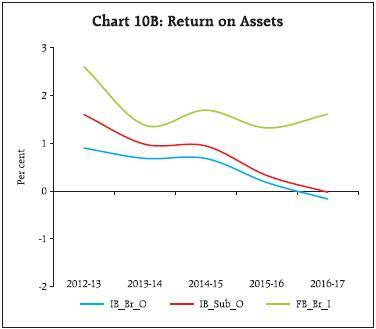 The profitability ratio (return on assets - ROA), however, plummeted for overseas branches/subsidiaries of Indian banks but it increased for foreign banks in India due to a surge in their non-interest income (Charts 10A and 10B). Country-wise data indicate that Indian banks’ branches operating in Bangladesh continued to have the highest ROA (3.8 per cent) during 2016-17 followed by banks in Maldives (2.3 per cent). In countries with larger number of branches, the ratio was lower at 0.5 per cent for Singapore, 0.02 per cent for the UK, and -0.05 per cent for Hong Kong (Chart 11). During 2016-17, international trade in banking services from/to India moderated due to subdued level of global economic activities. Global growth in trade in banking services has decelerated in the recent period, especially during the last three years, as reflected in international banking statistics (IBS) of the BIS. 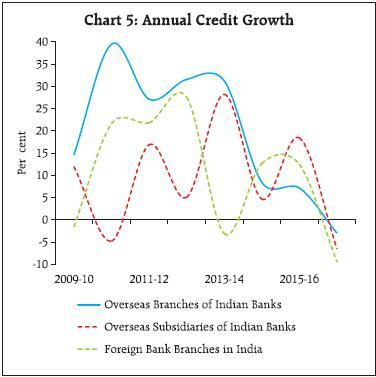 The expansionary phase of cross-border presence of banks has come to a near-cessation and branches / staff-strength of foreign banks in India reduced during 2016-17. The decline in the balance sheet was more pronounced in case of overseas banks from India than foreign banks in India. Lower demand for bank funds resulted in decline in lending by all bank groups. Deposit mobilisation by these bank-groups also declined, barring a marginal growth in demonetisation-related deposits of foreign banks in India. The weakening of fund based activities of cross-border banks was, however, not witnessed in non-fund based activities. Fee and other income remained an important constituent of banks’ profitability. Most of the fee income of Indian banks’ overseas branches came through rendering services to residents. Non-interest income is a primary component in total income for foreign banks operating in India, due to which their income and profitability generally exceeds that of Indian banks’ overseas branches despite a lower asset base. Bank for International Settlements, International Banking Statistics (web-link: http://www.bis.org/statistics/about_banking_stats.htm?m=6%7C31). Cornford, Andrew (2009), Statistics for International Trade in Banking Services: Requirements, Availability and Prospects, United Nations Conference on Trade and Development (UNCTAD) Discussion Paper No. 194. Gkoutzinis, Apostolos (2005), International Trade in Banking Services and the Role of the WTO: Discussing the Legal Framework and Policy Objectives of the General Agreement on Trade in Services and the Current State of Play in the Doha Round of Trade Negotiations, International Lawyer Vol.39, No.4 (Winter), American Bar Association. Reserve Bank of India (2006), Report of the Technical Group on Statistics for International Trade in Banking Services. Reserve Bank of India Bulletin (various issues), Results of the Annual Survey on International Trade in Banking Services. United Nations Statistics Division (UNSD) et.al. (2010), Manual on Statistics of International Trade in Services (MSITS). * This article is prepared by Seema Jaiswal, Prithwis Jana and Pallavi in the External Liabilities and Assets Statistics Division, Department of Statistics and Information Management, Reserve Bank of India. The views expressed in the article are those of the authors and are not necessarily shared by the Reserve Bank. 1 Detailed data related to ITBS 2016-17 survey have been released on RBI website (www.rbi.org.in) on November 1, 2017 where further details of the banking services covered under the survey are also given. 2 The previous article in the series with reference period 2015-16 was published in November 2016 issue of the Reserve Bank of India Bulletin.